As long as there are people who still believe that the gold market is uniquely manipulated, rather than simply in sync with the world economy, then the sad truth remains that we have not yet seen the bottom of the slide in gold prices just yet. Gold’s weakness led to a brutal sell-off among the world’s top gold miners and our Energy Models warn we are STILL not in an oversold position. On Friday, more than 22 million shares of Barrick changed hands as the price plummeted some 5% to the lowest seen since 1990. Gold has no friends left, only believers, as the price collapsed to the lowest level since April 2010 after the Fed said the world’s largest economy favors a rate hike counter-trend to Europe before year-end, which has strengthened the dollar. This was augmented by China announcing it has diversified its foreign reserves, placing only 1.6% in gold – a number that took the wind out of the gold conspiracy that China would back its currency with gold. The gold market has turned increasingly bearish with the once large gold futures investors, such as hedge funds, slashing long positions. The holding of such funds collapsed, falling below 1 million ounces, reaching new nine-year lows. As European austerity becomes widely seen as just insanity, the big money is starting to see the writing on the wall – buy dollars. The sell-off in gold was led by Barrick Gold Corp (NYSE:ABX, TSE:ABX), the world’s leading producer, as its shares fell 5% to the lowest in USD terms since 1990. Barrick’s market value is down 32% over the last three months alone, bringing its market-cap to just under $14 billion in New York, down from $64 billion at its peak in 2011. Barrick’s gold production is expected to fall further as it faces an oppressive debt-load of more than $13 billion – an amount equal now to nearly the total value of shares. 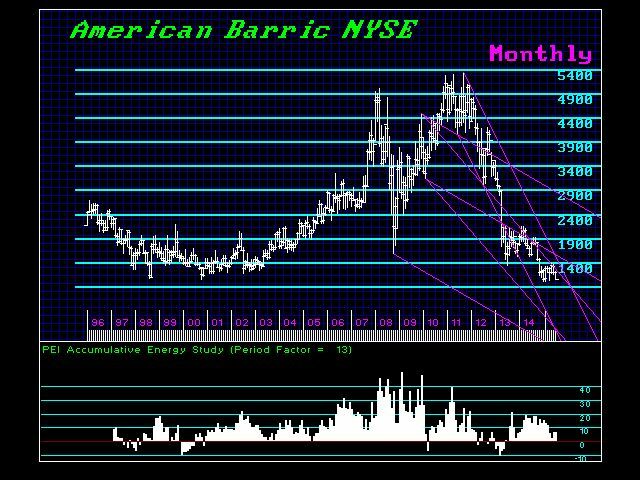 This warns that a rate hike may see the value of a Barrick collapse even further. Denver based Newmont mines, the second largest producer, is the only gold company that forms part of the S&P 500 index, yet it fell just under 3% on Friday. ADRs of AngloGold Ashanti (NYSE:AU), the world’s third largest gold producer in terms of output, fell 5.8% for a market value of $3.1 billion on the NYSE. « So Who is Still Long in Gold?